Is 60 the end of the blocks? 8-16-2017 no posting? 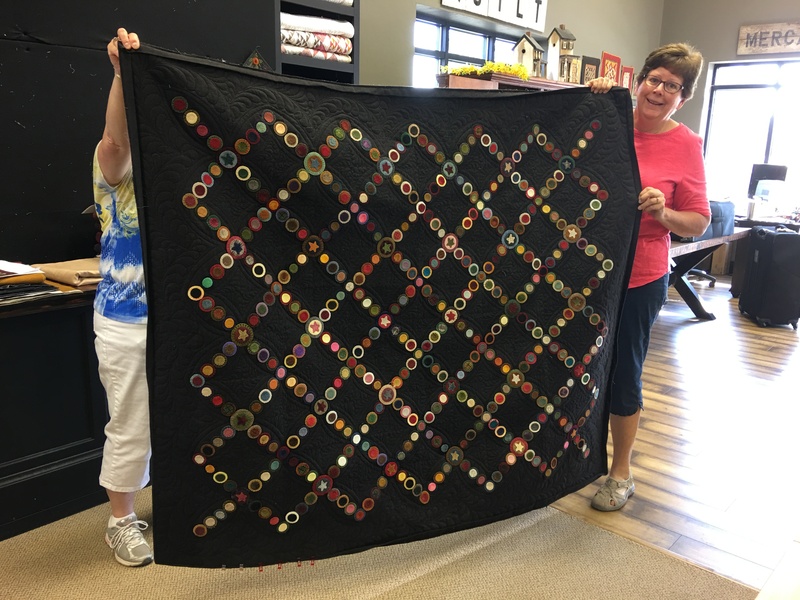 Kathy…made Penny Path from the American Patchwork & Quilting issue I am featured in ……Look how BIG she made it!!! So Awesome!!! Another wool project…we helped get that edge finished!!! Terry had two projects…one hand pieced another kit from PG- Small Treasures Book…she added a fab border… This was a bag…. 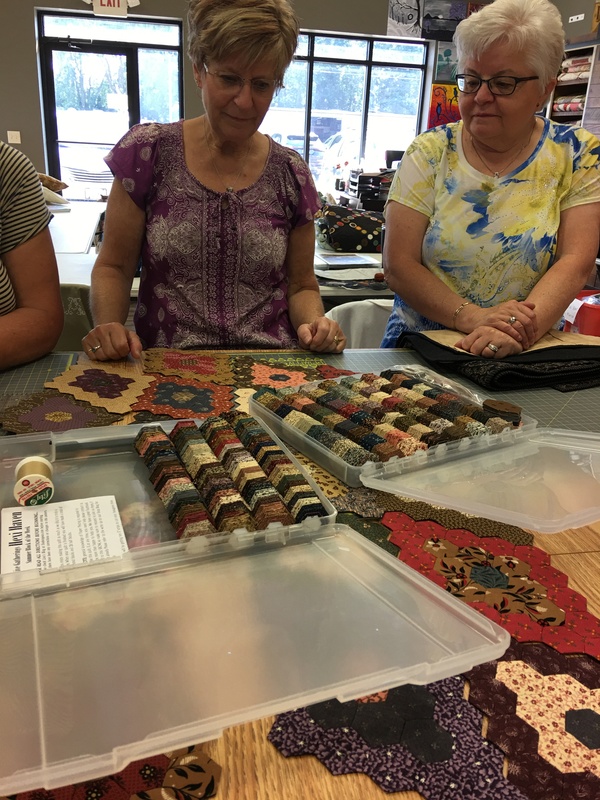 Then we all stared in amazement at Lori’s hexi project…look at this organization…so impressive…Makes me want a hex project!!!! Previous Post Moda Blockheads…Block 24…. Without a doubt prayers are being sent your way. This show and tell is fabulous. The talent and creativity is amazing! I know many of them have been inspired by you. Thanks for your new blocks. I’m a bit behind but I’ll catch up soon. Let’s face it — there are way too many rude and obnoxious people in the world today!!! This is a FREE project, so no one should be complaining!!! And there shouldn’t be any complaints even if you don’t get all the promised blocks out until 2018 – it’s a FREE project. Take your time, Lisa. The blocks and ALL of your patterns/projects are lovely! I, myself, could use some extra time on this triangles thing (LOL)..but, really, does it matter how fast we do this? I would think not! 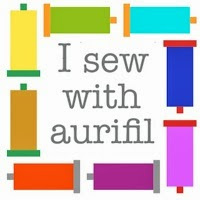 I so wish I lived closer to your shop, I would love a class/sew along. That hexi quilt makes me want to start back on mine! Take care of you and yours! Lisa, knowing how busy you are and how much time spent away, you & your family remain in my prayers. Stay strong, my friend! Prayers for you and your family. 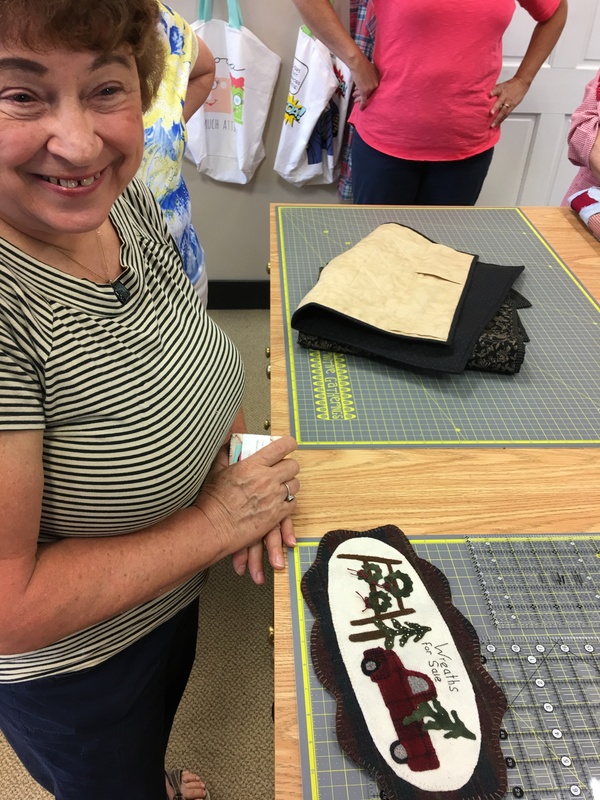 We are a quilting community that should support each have other. You and everyone else have a life outside of quilting and should not be so self-centered. Do what you can, when you can! Your block 62 is sewn together wrong, the left side needs to be frog stitched. But I am loving TG even though I only have them done through 51. I look forward to each new one released. Thank you. Absolutely agree with Susan – some people have forgotten simple RESPECT in many aspects of their lives these days!!!! Life happens, go with the flow! One never knows what may come up, nor when. Please & thanks go a lot further than rudeness. Our thoughts as well as prayers as with you & yours. Take one step at a time, one foot in front of the other; remember to laugh a little at the good things & smile whenever you can. Love the pace of the project – I am saving the instructions, so whenever the blocks arrive. Thanks for your creativity! I am so grateful for the free projects and the time you put into your work! I have learned so much from you. Paying for you and your family! Sending prayers your way Lisa. Though I am not doing the triangle QAL(it’s been HARD to resist) I have appreciated your generous spirit to share your talent freely! I have a bag of HST left over from a previous quilt, and I am going to use your posts for inspiration. I just couldn’t bear dumping all those triangle scraps in the trash, so I sewed them together and will cut them down, all because of your inspiration with this QAL. Blessings to you and your family. So many rude people in the world! Hugs from San Antonio!! Xoxo Lisa…..you and your family are in my thoughts! I alwayys enjoy your posts with all your pics. 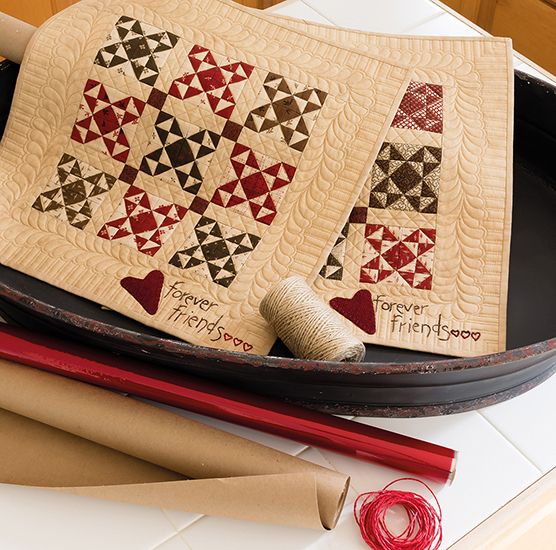 Just know you are well loved by us quilters for your generosity. I am amazed at all that you accomplish! Take care and have a great day! I think you and Jessica have so much patience when I see some of the comments. It actually made me giggle when I saw the new blocks because I just caught up to 60 and now I’m behind on the SBOW! I was trying to figure out should I catch up on the triangles or should I keep sewing on the SBOW, but decided it was good to switch it around a bit. BTW, that is not a complaint – you have just been so generous with the Triangles, the ModaBlock heads (which I’m only 20 blocks behind on that one) and the SBOW with the freebie – I just don’t understand why people are rude when your talent is a gift that you share with the rest of us for FREE. Plus, I’ve learned so much – stitching 3 inch blocks with fabric that has been thoroughly starched is so much easier and pleasant and smells nice too if you use the lavender scent. You have from the beginning told us that there would be approximately 90 blocks, and they would come when they come. If they all come January 1, 2018 so be it! Thanks for all you do and special prayers for your unspoken needs! Bless you. Holy smokes! These lady’s have some fabulous quilts. Thanks for sharing the great posting. It is inspiring. And…I’m going to say it again… take time to breath. You’re not letting us down. When you get to it… it will be. Prayers on the way !! Thank- you for sharing your talent !! God Bless !!! Lisa, dear, you are amazing to me. I want to grow up to be just like you–but I’m much older already! So that’s not going to happen! Please know that we ALL love to stitch along with your creations–whenever they arrive. And you are absolutely right . . . we ALL have things unexpectedly thrown at us. Life has its challenges, large and small, for everyone. We need to remember that our Super Hero Lisa is human, too. It’s hard to imagine it when you are so special. Love you! And sending loads and loads of prayers for you and your family. And lastly, there are many devotees in your many groups who would do anything to help you. Count me among them. Just reach out to us, and we’ll be there. Hugs and more hugs! Lifting you up in prayer Lisa. Thank you for all that you do. I’m afraid I am behind on the triangle gatherings and have fallen behind on my SBOW. As hard as I try to keep up, I am afraid I commit to more than I can keep up with. I’m so so sorry for whatever you are going through in your life right now. Sending good thoughts and hugs your way. You are an amazingly strong woman and I have faith in you to get through it and come out stronger in the the end. 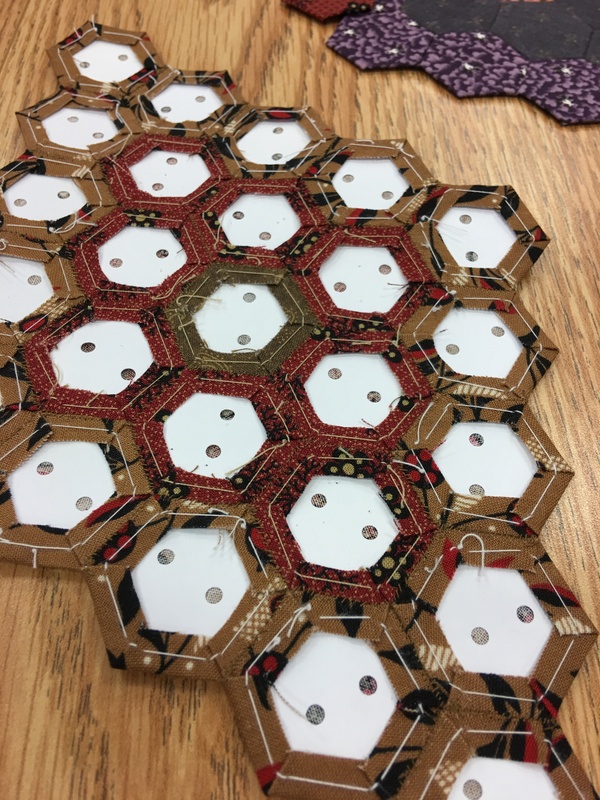 What is the thread that Lori is using on her hexi project? They are so awesome. And her project cases so organized. I am always grateful when there are a few extra days in between these blocks! You are amazing! I’m bringing them all to show you in St. George next week. Thanks for all you do😍😍😍Sending hugs and prayers❤Safe travels! No worries on the TG. Loving them and take your time! You are the best!!!! We love you Lisa. You are the best. Prayers to you and your family. I am sorry you are ever subjected to rudeness. You are so giving and caring to be posting these free blocks. They are amazing and you are amazing. Take your time, take care of family, these will always be there, no matter how long it takes. Thanks for all that you do for us quilters. Family first! Saying prayers for you and your family. Praying for you and your family, Lisa 🙏🏻❤️ So sorry there are so many rude people in this world. Your designs are awesome and your gifts of time and talent to all of us are amazing and much appreciated on my end. Your postings and projects, both free and purchased, bring such joy to my life. It is an insult to all when snide remarks are made. I am actively working on 4 of your patterns at this time and have great appreciation of your talent and respect for what you do. I shall keep you in my prayers. Beautiful work by everyone! Praying for you and yours. It’s hard to believe anyone would be so inconsiderate and rude to you. I’m certain the rest of us appreciate the time and energy you spend to send us these free beautiful projects. I for one am very grateful to you. Thank you. I and so many others appreciate what you share with us. We gladly give you whatever time you need to take care of yourself and your family. I am grateful for Triangle Gatherings, as are most people. Thank you for taking the time to post these blocks for us! I am sending you prayers. I’m way late to this party, so my question is in no way intended to be rude or demanding. And if it’s been answered in another post, I apologize, I haven’t been through all the posts and comments yet. I’m curious if I’m blind, daft, if blocks 54 & 55 are elsewhere, or if the numbering might have skipped a couple? Thank you for taking time to post these, I look forward to the rest. And I wish you well with whatever your something major is. Now to go read more posts and comments and see if I can find the answer myself…. Prayers for you and your family… may you have many blessings poured out for you! Thank you for all that you do !! Thank you so much for this wonderful triangle project. 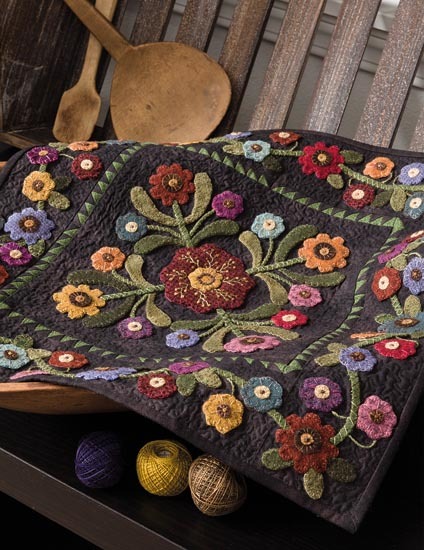 You are one of the most generous people in the quilting community. You are always sharing patterns and projects with us . I am sorry that you have to be subjected to rudeness. May you find more time for yourself and family. My thoughts are with you. Please try not to let that rude comment dwell on your mind. An ungrateful, ungracious person doesn’t deserve your time.I hope all gets better for you soon. Remember your family is the most important, we will always be here waiting for you. Lisa, I see how hard you work, I am in awe of all the great designs you post. 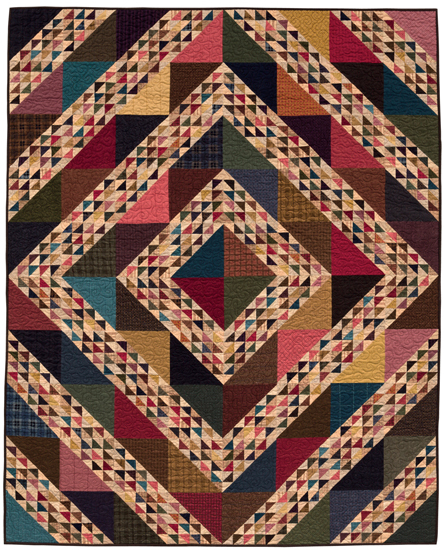 Triangle Gatherings is one more genierous gift you give to the quilting community regularly. You are living the greatest tragedy that can befall a parent and powering through. You are an unusually strong woman. I hope you can focus on the love and admiration we all have for you. Perhaps we need to say it more often so that unfair thoughtless comments will be pushed aside, as they should be. Meanwhile, you are in my thoughts as we await more news. Well I want to thank you for everything you do for us! I am “squirreling” them away so I will never run out of projects to look forward to making! Positive thoughts coming your way!! Prayers for you and your family. God is always available to help through difficult times and your quilting family understands that it’s important you take the time you need to care for yourself and those you love. You are an inspiration for so many. Blessing to you and yours. Sending prayers and let the bad stuff slide off. Keep up the great job Lisa! Lisa, prayers coming your way! Stay strong! Lisa, I am very happy that you are dishing these blocks out a couple at a time, once, maybe twice a week. I’m busy too, but I’ll use these blocks (ok, probably not all) and I love your newsy notes with the blocks. Lisa, was so good to chat with you a little bit at your wonderful warehouse sale! All the goodies are out of the bags and tonight, I start finding a home for them in the lab….Or that was the plan, till I saw the new blocks! Woohoo! the prefect excuse to sew before we’re all settled after our 25 day trip. Have been praying and will definitely continue to do just that. You guys can just count on that for as long as you need it. Thanks again for this great project…it’s sew much fun! PS….remember to breathe! Prayers for whatever is troubling you and your family. Remember if God brought you to it, he will bring you through ot🙏🙏. Don’t waste your time on rude selfish people. Spend it with your family and do what is right for you! I am sorry that you are facing difficulties or painful times/family challenges, Focus on what needs to be done with personal issues and don’t worry about us! Prayers for you. I’m so sad to hear that your life apparently has taken another challenging twist. I’ve been following you for many years and I know that there has been more than one sad thing that life has thrown at you AND Nick and I’ve always been excited when I see the good things like your trail of success in your business. I still have one of your old… was it Backyard Quilts patterns? Whatever the challenge is, you have my prayers Lisa. I have only been saving the TG patterns for when my life slows down a little. The timing is not an issue for me–and shouldn’t be for anyone, considering this is a gift from you. Don’t know what your needs are currently, but God does, so I will just raise your family to Him in prayer. Thank you for the blocks and for all you do. We love what you do Lisa and are so thankful for your generosity always, nor do most of us take for granted what you do for us. Unfortunately there us always someone who can’t help themselves but to whinge or complain. Luckily that is the minority but hurtful nonetheless. I’m sorry to hear that some peopleare not nice to you. I appriciate the time you take to make these free projects for us:-) Sending you love. You are in my thoughts and I’m sending you some positive energy to help you through your struggle ! Sending you warm thoughts with whatever you are dealing with. Sorry that someone made negative comments. People need to remember that we could all use a little more kindness in this world. Here’s my take on the remark you removed!!! You are giving us REE block patterns. I, and I’m sure, 99.99 percent of us appreciate that. I can’t imagine, as busy as you are, and as generous as you have been about freebies – that anyone would have the guts to make that sort of comment. You’re at the top of my list and I truly appreciate you and love your store and website. Thanks for all you do. I found the answer to my question about blocks 54-55 – apparently with all you have going on, the tag for triangle gatherings didn’t get added to that post and I didn’t think of that possibility. Even though I often have to go back and add tags to my own rare blog posts. As I said, I really hope my question didn’t come across as rude or demanding or…. I’m off now to go write 100 times “google is my friend”. And again, thank you for posting these and I hope all goes well with whatever has been heaped upon your already busy life. I have another take on the comment asking if 60 was the end. I don’t know who wrote it, but when I read (and re-read) it, I don’t think the writer was intending to be rude. I think that perhaps she was simply asking if 60 was the last block. Perhaps we need to extend some grace and patience to one another. Whatever is going on in Lisa’s life is clearly stressful, and perhaps this was an innocent question that just tipped the scale. And that’s understandable. I do wish that many of those who left a comment had not been so quick to call the writer rude so quickly. We all appreciate Lisa’s blocks, and I am sure we can all appreciate that something more important is going on in her life. Thank you, Lisa, for these free blocks. I haven’t touched my sewing machine for awhile as gardens, canning, & summer activities have taken over. But looking forward to them this winter & that’s how my life is busy. So I know how your life is even more so as you’re also running a business, teaching, & looking forward to new projects. Then a curve ball is thrown at you. May the knowledge of the thoughts & prayers by your many quilting friends lift you & yours. 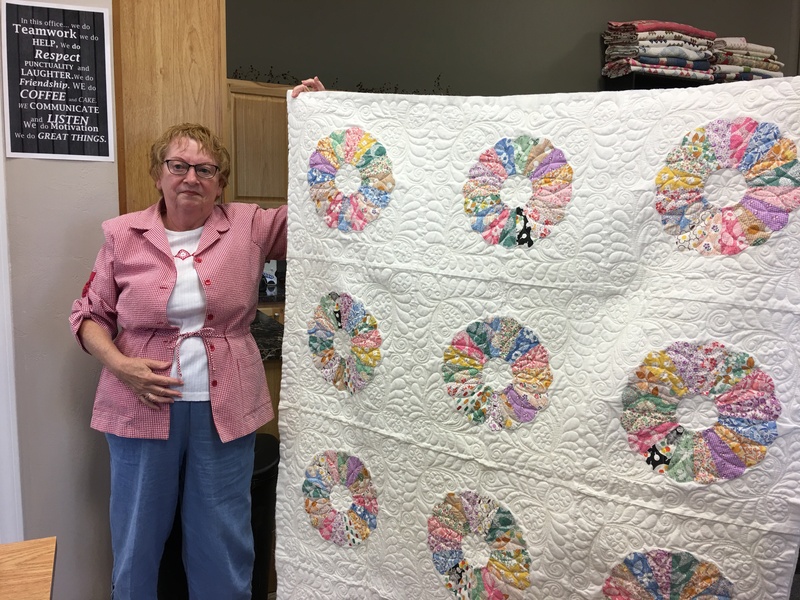 Thank you, Lisa, for all you do for us quilters. Your generosity is so great. I’m so sorry some are impatient and unkind in their comments. We appreciate you and your family, who allow you to give so much of yourself to we who quilt and stitch. Praying for you and your family. May I ask please, how to get on (if there is one) an email list for when these blocks come out? I am SO sure it’s posted somewhere, but I haven’t quite found it yet. I’m happy to come back to check from time to time, but I thought I’d ask. Sorry for whatever is going on in your life! Love and prayers to you! Prayers and hugs from MN, thank goodness you don’t throw everything at us at once, this way we can keep up. I do so appreciate how busy you are and surely would not want you to burn out. I am currently working on the geranium basket. Love you works of art, and we should all be grateful that you take the time to do a free project for us!!! You are an awesome woman and human being never doubt that. My prayers are with you and yours. Love scarf lady.